Immaculate 4 bedroom 3 ½ bath family home in Briargate/D-20. 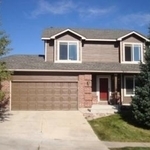 Newer three level home with open floor plan, finished basement, and huge deck/patio area. Three bedrooms upstairs with two full baths, one 1/2 bath on the main level and a bedroom and full bath in the basement. Upstairs master bedroom has walk-in closet. The master bath has tub/shower, double sinks, large vanity mirror and separate toilet area. Second and Third bedrooms upstairs have mirrored closet doors and nearby full bathroom and linen closet. Living room has ceiling fan, entertainment inlet, and auto gas fireplace. Kitchen has new granite countertops and tile backsplash, above range microwave, dishwasher, stove, side by side refrigerator and garbage disposal. Kitchen has hardwood floors and light cabinets. Bathrooms have light cabinets and large mirrors. Finished basement features rec room, one finished bedroom, one full bath, and an unfinished room for storage. Laundry room on the main level has linoleum flooring. Large composite maintenance free deck off the kitchen with stairs leading down to large stamped concrete patio, great for entertaining. Wired for cable/satellite, internet and phone. Two car garage with romote entry. Window blinds provided. Very close to shopping, two new hospitals, groceries, services, cleaners, etc. Just blocks from Briargate YMCA, Lowes, Super Target, King Soopers, Memorial Hospital and much more. High demand District 20 Schools. Beautiful house located in great Sagewood neighborhood. Available FEB 2009!